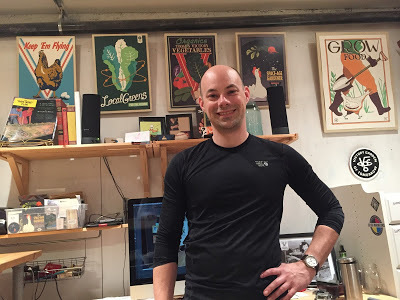 Joe Wirtheim’s graphic design project The Victory Garden of Tomorrow is a form of active art. 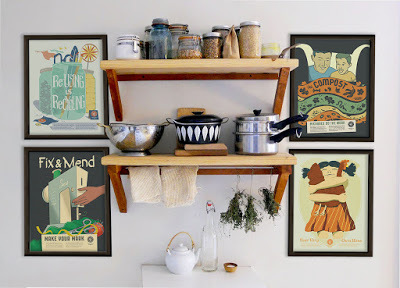 Inspired by the artistic style of the 1940’s and the Victory Gardens of World War II, Joe creates posters, signs, and other household items that encourage a new but familiar connection with our consumption and lives. Joe’s art work speaks of a future connected to the past and of a life connected to our actions and to community. It’s a picture of thoughtful consumption and connection to nature. The Studio: I always feel privileged when I am invited into an artist’s studio. It’s hard not to feel and sense the creative energy inside and feel almost part of the art itself. Joe’s studio was no exception. His posters lined one wall. Old photos hung on another wall. The simple work bench-table was ready for work. A MAC computer sat on the desk. In a way, the studio reflected Joe’s work. A combination of old and new to find a more connected way forward. Inspiration: Joe confesses that he’s always had a soft spot for the style of 1940’s artwork. He loves the voice and vernacular of The Victory Garden movement during World War II. He admires the feeling of community and shared goals combined with a sense of urgency. The World’s Fairs of the 1930’s also fascinate him. Joe wonders what a Victory Garden would look like now or what would be in the gift shop of a World’s Fair. A Connection: Joe was living in Ohio when he started The Victory Garden of Tomorrow. He worked in a food coop and spent time cooking and canning. He developed an appreciation for being connected to the food he consumed. Growing up in a time when food came from the grocery store, many of us lost that understanding of where food comes from. Food was a commodity on the shelf in the grocery store instead of something grown from the earth in tandem with nature. Active Consumption: The Victory Garden of Tomorrow points us to a place of a more active consumption, Joe says. A place where we see and sense the relationship between our consumption and nature, community and home. Then, we act on this knowledge. It’s not just the art that sends this message. It’s also the slogans Joe writes, such as “Rediscover Your Kitchen” or “Break New Ground.” The graphic art and words connect the past with the future and offer a straight forward vision for acting. Finding Connection: The posters Joe creates are the flagship of his project. But, Joe creates many other items that share the same message and spirit. There are the yard signs for your urban garden or chickens. Joe designs towels, patches and calendars. It’s funny he says as he shows me his work. The solutions for the future are not like what we saw in The Jetsons. He’s designing art to bring us closer to the kitchen and the garden, and to help us step away from technology for technology’s sake. Start Small: Joe says it starts with an idea and a tiny sketch. He pulled out a small notebook, and showed me the size of the original drawings. Joe explains that the art has to start small for it to work. Once he’s finished a sketch, he colors and shapes and sizes using software. Joe does a lot screen printing with his designs, and Joe pulled out a screen and explained the manual process of screen printing. It’s a simple process in a way, but also one of precision and foresight. The small things matter. Discovery: Joe obviously loves what he does. He’s got a background in industrial engineering, communication and media, and is well educated for getting art done. He remarks that the challenge he faces is how to grow his business. He tells me of the time a Martha Stewart Living editor spotted one of Joe’s creations in a local Portland store. The magazine reached out to Joe, and there was a short blurb about The Victory Garden of Tomorrow in an issue. Joe says things just exploded. Website traffic and inquiries increased many fold. He wasn’t quite prepared for the volume of interest. Smart Growth: Joe says the difficulty is learning how to manage the retail business and all that involves. He wonders how big you can get while still keeping the same spirit. He believes, though, that showing up is half the battle. Somehow I think Joe is on to something big here and that he’ll stay connected to his art and his project. Spirit for the Future: Joe definitely has a passion for creating and making things himself. 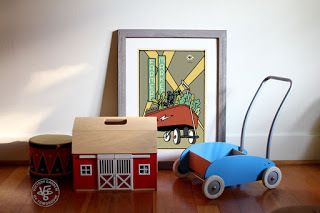 His latest endeavors include making the wooden frames for his paintings and sewing! A corner of his studio is dedicated as a wood shop. Joe says his father was a talented wood worker, so maybe it runs in the family. I think it’s also that Joe has the spirit and courage to experiment, to look back to find the future, and to share his vision with us. What will he be up to next? 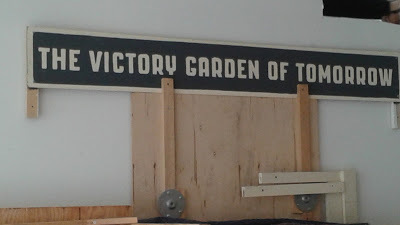 I've always been entranced by the idea of the Victory Garden, and have never understood why this isn't just something we all do, everywhere, all the time. I think Portland does a better job than some places, with raised beds, even in the front lawn. But I aspire to do better. And I love the idea that this could be an idea that would take hold again. I think we would all be the better for feeling the joy and pride (not to mention Good Eats) grown ourselves in our own yards and communities.